It’s taken some compiling, mostly because while I found several songs which fit the criteria I set for myself, the majority weren’t songs I liked. Here’s my list, all from pre-70s films that I’ve seen. As always, these are in no particular order. 1. Chhuppa-chhuppi o chhuppi (Savera, 1958): To begin with, a children’s song, and that too my favourite of the genre: a whacky, funny little song about a bunch of mice who’re scurrying about, fearful of the cat—who tries her hardest to convince them that she’s very good, very devout: Main toh chali Kashi, gale mil jaao (I’m off to Kashi, come and give me a hug). The mice aren’t taken in so easily, though. 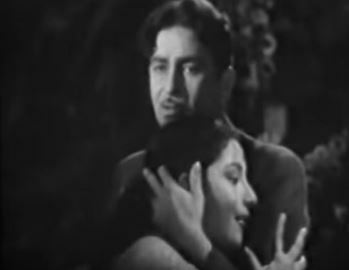 While Meena Kumari’s character—a widow—does have a romantic relationship with Ashok Kumar’s not-really jogi in this film, this song shows only one easily missed visual sign of that: when each of them, surrounded by their respective groups of children, momentarily find themselves in close proximity and look briefly over their shoulders—and their eyes meet. But the lyrics, and even the picturization, have nothing to do with romance. 2. Saathi haath badhaana (Naya Daur, 1957): Like Chhuppa-chhuppi o chhuppi, a song where the two singers are surrounded by others (though when has that ever made two lovers in Hindi cinema flinch from expressing their love?) Here it’s not children, but fellow villagers and workers on a road, being built in a race against time, to be ready for a crucial race: of our hero’s tonga against the ‘motor’ of the outsider—a metaphor for dehumanized (and dehumanizing) modernity. As they work, they sing: the hero and the woman he loves, urging their friends on, encouraging them to join hands to get their work done. A classic song of socialism. 3. 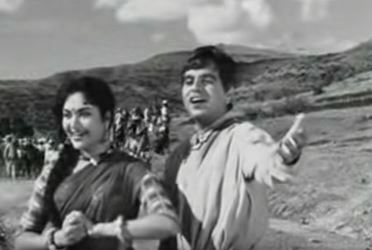 Dharti kahe pukaarke (Do Bigha Zameen, 1953): From one song set in the village to another—and this one a very poignant one about how time passes, how the seasons change, and how a human being should move on. 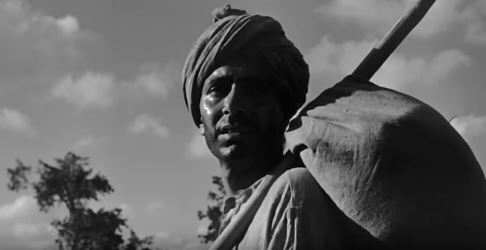 Even as Shambhu (Balraj Sahni), crushed under the weight of a debt he cannot hope to repay, is forced to go to the city (Calcutta) in order to make money enough to get back the two meagre bighas of land that are his—he passes through the fields where the people he has lived amidst all his life are busy at work. Their words encourage him, yet tug him back, reminding him of all that he will miss. A lovely song, and rendered beautifully by Manna Dey and Lata Mangeshkar. 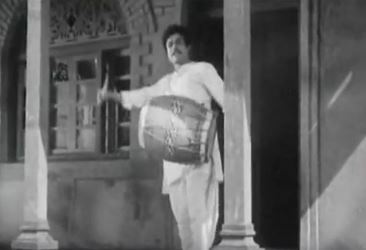 Interestingly, Do Bigha Zameen had another male-female duet that wasn’t romantic in tone: that classic celebration of the monsoon, Hariyaala saawan dhol bajaata aaya. 4. 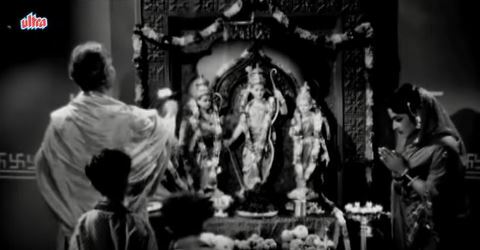 Gagan jhanana raha (Nastik, 1954): Several of the best devotional songs, the bhajans, in Hindi cinema seem to be sung as solos, at the most with a chorus. And most of them are picturized in the staid, sanitary surroundings of temples. Not this one. Nastik’s heroine, played by Nalini Jaywant, is all alone by herself in a boat (without even the support of oars), and is headed for what looks like certain death. A storm tosses her boat about, and (just in case she hadn’t realized just what peril she’s in), the silhouette of some sort of celestial being appears in a far-away vision, singing to her to beware. And she, storm notwithstanding, joins in the singing, addressing her song to all the gods that be, begging them to let her survive. Who, in such a condition, can possibly think up words and belt them out so perfectly in tune, at a time like this? And yes, despite all that sarcasm I’ve heaped on it, a lovely song. Bhajans aren’t usually my cup of tea, but this one, I like. 5. 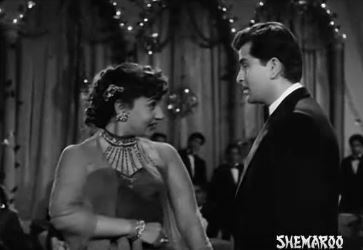 Woh subaah kabhi toh aayegi (Phir Subaah Hogi, 1958): Raj Kapoor and Mukesh isn’t a combination I like much, but this song happens to be one of my favourites. Khayyam’s very restrained music showcases Sahir’s lyrics—lyrics that provide a ray of hope for people sunk in despair, people crushed under the heel of a rapacious society that has no room for humanity. Interestingly, while the picturization does show the deep love between the two characters—mark the affection in the way they look at each other, the obvious comfort they derive from each other—there is not a trace of romance in the words they sing. 6. Umad-ghumad kar aayi re ghata (Do Aankhen Baarah Haath, 1957): I watched Do Aankhen Baarah Haath when I was in my early teens (possibly not even a teenager); till then, almost all the Hindi films I’d seen had had romance as a pivotal element of the plot. This film shook me, because it was so different from all that I’d seen before—even down to the fact that though there was a woman playing an important role in the film, there really wasn’t a romance. (I didn’t know back then that Sandhya had been married to V Shantaram; had I known, that would have made it even more surprising for me). But I am now old enough to accept (and even appreciate) the lack of a romance in a film. And this song, celebrating the coming of the monsoon, is a fine example of a duet that has nothing to do with romance—unless it’s the romancing of the land by the rain. Barkha dulhaniya (‘cloud bride’) is what Sandhya’s female minstrels call the storm clouds that loom, heavy with rain, and it’s an apt description of how welcome the monsoon is. 7. Saanwle-salone aaye din bahaar ke (Ek Hi Raasta, 1956): The appreciation or praise of nature and God (or, as some who think them synonymous would say, nature/God) seem to be among the main themes for songs that are non-romantic but sung by men and women. Umad-ghumadkar aayi re ghata falls into that category, and so does this one. Even though pyaar (love) is mentioned a couple of times in Saanwle-salone aaye din bahaar ke, it’s not specifically romantic love, but love in its very essence: a love for family, a love for nature and for life. 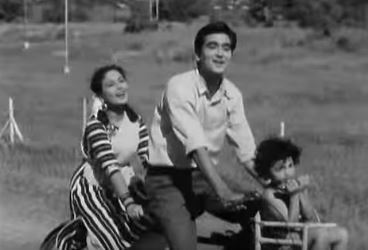 I like the picturization of this song: Sunil Dutt, Meena Kumari and Daisy Irani on that bicycle are the very picture of a happy little family out on a jaunt in the spring. 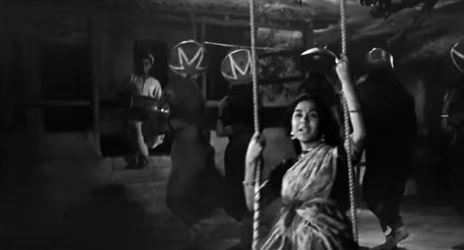 Really sweet, and there’s an especially cute moment when Meena Kumari, gesturing (and therefore having let go of the cycle or of Sunil Dutt), suddenly lets out an inadvertent gasp and grabs, because a jolt nearly throws her off-balance. 8. Ae dil hai mushkil jeena yahaan (CID, 1956): A classic song. Classic in many ways: classic Bombay, classic philosophy, classic when it comes to music and lyrics and singers and picturization. Plus, of course, the reason why it’s here in this list: it’s a song that features a man and a woman (who are sweethearts), but singing not of their love but of other matters. He bemoans the fact that Bombay is such a brutal city, so harsh and materialistic; she disagrees—how you treat others is how you will be treated, she implies, so if you stand up to it, Bombay (or, by implication, anybody anywhere) will also cooperate with you. 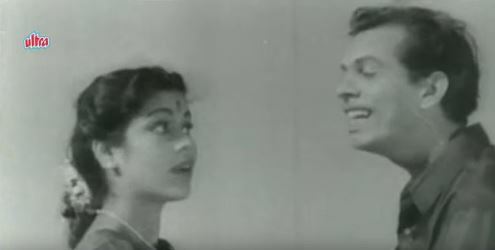 Even though the picturization has elements of affection in it—in the playful way Johnny Walker and Kumkum tease each other, both in the Victoria and later off it—the lyrics have no romance in them. Just pure philosophy. 9. Jai Raghunandan Jai Siya Ram (Gharana, 1961): When I set out to compile this list, I thought I’d probably be able to find several instances of non-romantic male-female duets among devotional songs. There are some (one which I especially like, though it’s sung by a trio rather than as a duet, is the beautiful Darshan do Ghanshyamnath), but the majority here too seems to be solos. Or duets that aren’t that great. But there’s this one, in praise of Ram and Sita, which has a small family, children and bahu included, gathering to worship. While the two boys gaze greedily at the edible goodies heaped up in the household shrine, the adults sing a bhajan. 10. Mud-mudke na dekh (Shree 420, 1955): And, to end, a superb song that has so much to recommend it: a very attractive Raj Kapoor in a tux, a steely-eyed but beautiful Nadira in (towards the latter half of the song) a sheath dress that was so tight, she wasn’t able to sit in it); and a young Sadhana, supposedly as part of the dancing extras. Plus, lovely music, great rendition by Asha Bhosle and Manna Dey—and a song that, despite that “Hum bhi tere humsafar hain” (“We are fellow travellers on this road”), has absolutely nothing to do with romance. Because, from the moment the naïve Raju has met the aptly-named Maya, there has not been a jot of affection or passion between them. He, initially dazzled by her wealth and power, has allowed himself to be ushered into her world, and she, realizing his usefulness as a profitable partner in crime, has made this relationship what it is: a cynical understanding of what a harsh world this is, and how one needs an ally in order to get through. What a wonderful, wonderful theme for a post, Madhu! I can safely say I’d never have thought of it. Lovely, lovely, theme. Ichak daana bichak daana qualifies, but Chadh gayo paapi bichhua has this very definite implication that it’s because of meeting the lover that the scorpion’s sting has been negated – so I wouldn’t call that a song with no romantic tones to it. I had never heard the song from Do Boond Paani: it is beautiful, such poignant lyrics. I had O dilwaale ab teri gali on my shortlist, but the dilwaale word itself seemed to me to imply that the two singers are romantically involved. Not that the rest of the song is really romantic, but still. I would immediately add “Chali kaun se desh” [Talat-Asha] from Boot Polish, “Mera Naam Abdul Rehman” [ Kisore-Lata] from Bhai Bhai. 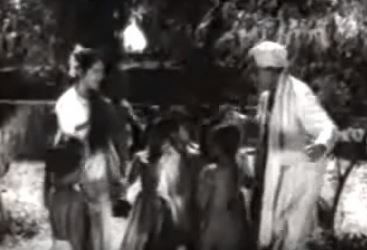 I have written: “Furthermore, I added one more rule for myself: that the actors should both be adults (because there are far too many songs which have a female playback singer singing for a child onscreen).… which is why Chali kaun se desh doesn’t qualify – even though it is my favourite song from the film. Abdul Rehman ki main Abdul Rehmaniya, yehi mera sona-chaandi yehi meri duniya is definitely romantic – which is why Mera naam Abdul Rehman doesn’t qualify, either. Good. I overlooked both points. If a male-male one is permitted, Ek chatur naar from Padosan would be on the top of my list! Why not ” jir jir badrwa barse o kare kare ” fro Pariwar ? Because there’s not a single line in the song that isn’t romantic? I have been out of town for the past two weeks, so here’s a belated birthday greeting as well – Many, many happy returns of last week’s birthday! Thank you for the birthday wishes – even though we haven’t actually met in person, it felt a wee bit like actually meeting you! Thank you so much. I got really excited when I saw you in the video. I’d forgotten all about this! Yes, perfect example. And a good song! Sawa lakh ki lottery is definitely a perfect fit (I’m wishing I’d remembered that one! ), but I wouldn’t call Kali ke roop mein a non-romantic song; the banter itself is imbued with flirting. I hadn’t heard Zara jhoom le before, but even that has romantic overtones – every now and then, the message is that this youth is fleeting, so one should enjoy oneself and fall in love (“Sun le mann ki baatein baalam,”, for example). Thanks for an amazing post! I didn’t know two of this songs and I have absolutely forgotten the beautiful song from Do Aankhen Baarah Haath – thanks for remind me it. I don’t speak hindi so I am not absolutely sure but I suppose that Kamaata Hoon Bohut Kuch from Adhikar can be qualified. This rabindrosangeet Baro Asha Kore, which was used in the movie Rajbadhu is a bit out the time frames but it certainely can be qualified – this is a song about the mother. And then Bada Badhaayi na Kare from Akhiyon ke Jharokhe se.. Somehow the only song from this film that I end up remembering was the title song – it was so ubiquitous once upon a time! Yes, the patriotic songs, the motivational and revolutionary songs, are the ones I looked for, too. Found plenty of them, but most seem to be from after the 60s, or otherwise not great songs. Yup, the 70s seem to have their fair share of songs like this. Wow ! What wonderful songs. Hats off to you for coming up with such a theme. Enjoyed listening to every one of them and then some in the comments. Unarmed ghumar lyrics are a showcase of apt. Bharat Vyas’s poetry. Saathi haath badana is one of my favorite songs, there is something about the prelude music that got me hooked from the very first time I heard it. Here is a similar song from Insaan jag utha. I also like “Vande Matram” from the same movie by Lara Mangeshkar and Hemant Kumar, but Hemant Kumar is only singing aakaar in the background. Thank you for the birthday greetings, Neeru, and for the songs! Mehnatkash insaan jaag utha is a wonderful song, and had been on my shortlist, so I’m especially happy to see that you added it. I’d been toying with the idea of putting in Vande Mataram but as you mention too, Hemant is there only technically speaking – it cannot really be called a duet. Glad to see you included Keshava dhrit meen sharira, jai jagdish hare instead. Thank you. I’m not sure, though, why you suggested the songs you did – because they’re all thoroughly romantic. If I had to make a list of romantic songs, those would probably figure at least in the shortlist. Bholi sooorat dil ke khote and Lara lappa lara lappa both fit, though I’m a little ambivalent about the former’s fit – as a ‘battle of the sexes’ song, it also does touch on the romantic angle (even if deriding it). Brilliant post! I loved it. “But bring a man and a woman together, and it seems as if everything begins and ends at romantic love.” That is so funny and true.. I am surprised that you actually found those 10 songs.. I could only think of “Woh Subah Kabhi To Aayegi” almost immediately as I saw your post. Thank you so much, Ashish! I’m glad you enjoyed this post. :-) And yes, finding ten good songs to fit this list was a real task; it took me quite a while. I love the idea of a ‘singing villain’ challenge. Offhand, I can think of songs (in Munimji and Half Ticket, for example) where the villain does sing, but not of his villainy. It’ll be interesting to try and see if there are actually ten songs where a villain’s boasting of his villainy. Yes, both beautiful songs. I have mentioned (though not listed) Darshan do Ghanshyamnath in my post, and another reader has given a link to Jai Jagdish Hare in her comment. Oh, yes, Shilpi. Good song. Thanks for mentioning that. Wonderful read, as always! This one really had me engaged. Does ‘Ek sawaal main karoon, ek sawal tum karo’ count? I also thought about ‘Kuhu kuhu bole koyaliya’. The lyrics can be construed as being about love but I feel like the song has so so much more to it. But then again, the verse lyrics are in clear contradiction with the theme. And that reminds me of another one, ‘Duniya rang rangeeli baba’ from the film ‘Dharti Mata’ (1938? ), although there seem to be more than 2 vocalists. But it’s definitely worth a listen. Oh and happy belated birthday from a long-term loyal reader! Best wishes. Ek sawaal main karoon ek sawaal tum karo does have this bit about Pyaar ki bela saath sajan, so I would say it does have a romantic angle to it. Kuhu kuhu bole koyaliya would, I think, have a better chance of qualifying – it’s more a paean to the beauty of nature (perhaps as a backdrop for romance, though if I remember correctly, it’s never explicitly stated). And Duniya rang-rangeeli baba is a good one. Long time since I heard that one; thanks for reminding me of it! Lovely post! Loved going through it. Moreover, I’d never thought of the songs like that, in romantic and non-romantic way, although it is quite plausible. In contrast to many posts of yours, I do differ in opinion here. Chuppa-chuppi will remain a romantic song for me since it does help them bring together. The text might not suggest it but the plot needs the song to forward the romance. Mud-mud ke na dekh is essentially a seducing song for me, so I wouldn’t have put it in. But of course, we all have different ways to perceive songs and situations in films. The readers of the blog have put many a nice song, which meet your criteria. But the one which I love the most from this post is ‘woh subah kabhi to aayegi’. Both of them makeme marvel at the talents of the singers. The former also makes me laugh at your uncle’s part in the chorus. Thanks for the post, Madhu. Thank you, Harvey! Glad you liked this post. And that’s an interesting take on Chhuppa-chhuppi and Mud-mud ke na dekh. The two songs from Anand Math are good. I toyed with including Vande Mataram on this list, but then decided that actually only one voice dominates – Hemant is there only technically – so skipped it. A very interesting topic this time! Male & female singing a duet but not romancing! In most probabilities, it could be a bhajn, some drama competition, some revolt or revolution scene, some sad situation, some informative or describing situations etc. Equally interesting are the comments from the keen readers & followers. Basis the above, I could recollect 2 songs, Aaiye Padhariye from Geet Gaya Patthron Ne and Bhar bhar aayi akhiyan from Samrat Chandra Gupta . Equally interesting is another song, Taaron Ki Zabaan Par Hai Muhabbat Ki Kahani, from Nausher wan-e-Adil. Though it appears to be a romantic song, but both the hero & the heroine are only describing & praising the eternal love between the moon & stars, the vanishing & emerging phases, alias the youth, of moon, & comparing the moonlight with the mesmerizing aura of romance. The complete song is wonderfully distant from the personal affections. Thank you for those songs. The only one I would disagree with is Taaron ki zubaan par hai mohabbat ki kahaani, which I think is definitely romantic in tone. Rather like Parbaton ke pedon par shaam ka basera hai, it uses (in my opinion) nature only as a stand-in for the romance of the two characters themselves. The lyrics suggest it, the picturization suggests it, and wherever this was played in the movie, it was always to suggest the love between these two. The tone of the song at S.No. 7 of the list, I thought to be very romantic with lyrics “aaya zamana gao geet pyar ke” along with the fervor as in it’s picturization. This further reminds me of a bhajan from the ’58 film Jailor. The duet is by Asha & Rafi. I don’t recall hearing Mujhi mein chhupkar mujhi se door before. Thank you for this – I really liked it. Gareebon ki Suno from the film Dus Lakh . That had been on my longlist, too, but I don’t like it much, so that got dropped. 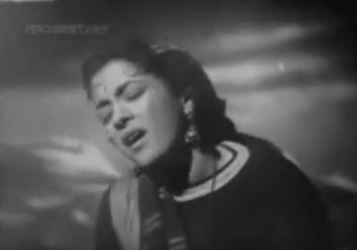 Naseeb hoga mera meherbaan from the film 40 Days -1959. I wish I’d remembered that! It’s a song I like, very much. A brother Sister song from the film Barkha – Wo door jo nadiya behti hai . Yes, I’ve heard that one, too. Some addition of my personal favorites. I wish to refer to this song where the hero and heroine praise each other, but expressly state that they are hesitant to say what they are saying, since it may be construed às love for each other. Thus, technically it is not a love song, but to me, it is one of the great love songs ever. Lyrics: Tere husn ki kya tareef Karin, kuch kehte hue bhi darta hun, kahin bhool see tuh na samajh baithe, ki main tujhse muhabbat karta hun. Dileep Kumar &, Vaijayantimala Mala in Leader, MD Naushad. Posted more with the intention of drawing attention to the sheer poetry of yesteryears’ lyrics! Yes, that’s a nice song. For me, the only thing good about Leader were its songs. I do think that’s a love song, no matter what the lyrics may otherwise suggest – very definitely a love song. but we can include all sad male female duets in it! Of course. Provided they have nothing to do with romance. As I’ve mentioned in the introduction, even a blighted romance – the supposed or real faithlessness of a lover – becomes the theme of a song, which means that the theme is still romance (or failed romance). If the sadness has nothing to do with romance, then certainly the song will qualify. Did you have any particular song in mind? i actually searched for a song that i can suit ur theme. but couldnt get one easily. Hats off to u for ur search! so no song to post right now. one more song i have in mind, but i am not been able to recollect it. sung by Shamshad And Kishore Kumar. its a LORI , i think, to which i came across on SOY. angarey is the movie i think! of course we can include two songs from Devdas 1955. Aan Milo Sham Sanvare, though may not b actually a bhajan, it may portray the emotions of the heroine to her love. Sajan Ki Ho Gayi Gori…….. Both songs by Geeta Dutt and Manna Dey. So, no. Even by that standard, Aan milo shaam saanwre doesn’t count. i agree about the both! I must admit the only song from those that I recall having heard is the first one. But the others too sound as if they fit the theme. Thanks for those suggestions! the chacha zindabad song is about how the both got out of some trouble and saying good bye to one another, i havnt seen the film of course! u must have heard the song i am sure. its nice and pleasant, with typical O P Nayyar rhythm of horse cart. jeevan ki gadi is about life in general with the heroin travelling in train, with tearful eyes, again havent seen the movie. the other songs from the same movie are- chanda chamkati raat and pyar ki nishaniyan. Ab darne ki koi baat is about the British people finally gone from our country and now we can breath a fresh and free air. its again a nice song! My father also havnt seen this movie, being released during his birth year 1948.
u have included bogie bogie by shamshad & durani from the same movie. No, I haven’t. Someone else suggested it in their comment. Thanks for explaining about those songs – I just didn’t have the time back then to go looking for them and listening to them myself. it wasnt u who suggested it. i dont know how to send link for a perticular song on you tube. so i couldnt send the links for easy referral. i am yet to read ur latest daaru songs! i’m eager to read it and reply. Here is one I just recalled: Chanda se hogs woh pyaraa, music by Chitragupt. Actually, copy of a Tamil song Poo pola poo pola, sung by PB Srinivas & Susheela. In fact PBS also sang the Hindi version with Lataji. Basically, a husband-wife couple singing about their to-be-born son. How they know it is going to be a son? is the question not answered. Does this qualify? Oh, yes. I remember this song. I’ve forgotten which film it was (Main Bhi Ladki Hoon? – I’m not sure). From what I remember of it, it does qualify, because if I recall correctly, the entire song is about the baby… unless there’s a reference to their own love for each other there. You are right about the film – Main bhi ek ladki hoon. In fact it occurred to me when I was posting but I was not sure, so did not mention it. Surely, both of us can’t be wrong. As for the song, absolutely no mention of any love between the couple. But the fact remains that the song is about a child born out of mutual love and so there is a vague backdrop which, some may argue, takes it out of the non-romance genre. Food for thought! I couldn’t agree with you more! That is difficult to categorize indeed. Ambiguous. yes, the song is entirely based on the their to be borne baby. ur daaru songs is not a recent post! No problem. Yes, that’s an old post. Several years old. kaisi tune reet rachi bhagwan from oonche log. i was about to suggest chhota sa ghar hoga from naukari also! though, i still have a doubt that, it may fit! as last time, when i posted them, i was unable to send links for those songs! after watching the vdo , I am not sure whether, the last one really qualifies or not! I’m sorry, but I am facing a lot of problems right now – a bad net connection, a very sore throat, and conjunctivitis. Plus, the fact that I’ve just shifted into a new house, and things are an absolute mess. :-( So I don’t have the time to go through all these songs. Offhand, though, I don’t think Raat gayi phir qualifies, since the ‘woman’ singing in it is actually a little girl onscreen. That, if you see the rules for this post, isn’t allowed. the girl (baby Naaz, I think!) sings the lines, and I forgot the rules. I was also wondering how come u didnt reply for 4-5 days.This happened for the first time , i think, since i am visiting the blog! Take proper rest, and in conjunctivitis, u r not supposed to strain ur eyes! so should be able to post something soon! a theme based song list, i wish. Allergic conjunctivitis to dust…… has a tendency to recur. Song list will be up next. :-) In a couple of days’ time. Love to have a post from you of body parts, to make the task easier, here are ten of them. External— Aankhen, hont, baal/zulf, gaal, haath, kamar, paon, Internal— Dil, jigar, oh can’t get the tenth one, leaving it for you. I have a half-made list along those lines, but not exactly. Will get back to it and do it someday soon. ;-) By the way, I think body parts like aankhen, zulf, paaon and even haath and gaal could invite entire lists of their own – I’ve already done one for aankhen anyway. Didn’t quite like the theme this time, very frankly. Nor the songs are very famous. Do you mean the food songs list? If so – well, they’re my favourite songs that fit the list. Not necessarily anyone else’s, and not necessarily famous. I have never claimed those as the criteria for any song list. of course, this song is for ur info, in case u dont know it! I hadn’t heard either of these before… nice. P.S. I deleted one comment of yours, where you put in the link for bananewale… but wrote Kaari-kaari. I think Koyal Kyon Gaaye from Aap Aaye Bahaar Aayi, where the characters talk about the bird chirping in the forest. I actually think that’s actually pretty symbolic of love. There’s mention of birah and aag lage jaaye and all those other sufferings of people in love… so no, I wouldn’t say this qualified. So you don’t think so?